Artist concept of NASA's Europa mission spacecraft approaching its target for one of many flybys. 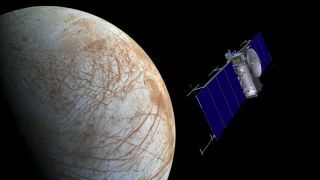 A plan to launch a spacecraft to Jupiter's moon Europa in the 2020s passed a major hurdle, as NASA approved the mission concept and gave the go ahead to move forward into the formulation stage of development. Sending a flyby mission to the icy moon of Jupiter is considered key in helping scientists determine how likely life is to exist there. If the probe shows that conditions on Europa would permit microbial life, other moons in the solar system, such as Saturn's moon Enceladus, might host life as well. The current plan would see the spacecraft do 45 flybys of Europa while orbiting Jupiter every two weeks. Science goals include taking images of the icy surface, as well as remotely probing the moon's interior and composition. "Today we're taking an exciting step from concept to mission in our quest to find signs of life beyond Earth," said John Grunsfeld, associate administrator for NASA's Science Mission Directorate, in a statement. "Observations of Europa have provided us with tantalizing clues over the last two decades, and the time has come to seek answers to one of humanity's most profound questions," he said. NASA's Jet Propulsion Laboratory (JPL) in Pasadena, California will manage the Europa project. A suite of instruments chosen to fly aboard the proposed spacecraft was announced in May. While the Voyager spacecraft did a quick flyby of Europa in the 1980s, it was NASA's Galileo probe in the 1990s that provided more evidence for a global ocean underneath this moon's thick icy surface. Two years ago, researchers using the Hubble Space Telescope released images of a water plume at Europa, a find that has not been repeated. The White House's 2016 federal budget request includes $18.5 million for the mission's development. The previous year, Congress provided $100 million after a request was made for just $15 million.